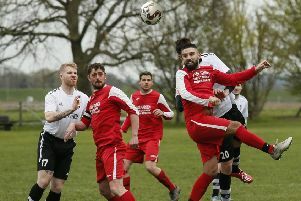 Bedford Town emerged victorious over Kempston Rovers in the North Bedfordshire derby on Saturday winning 3-1. As with other games between the two rivals over the last three seasons, the latest derby didn’t disappoint and drew a crowd of 357 to Rovers’ Hillgrounds stadium. The start to the game was tentative, but it came fully to life on 14 minutes when the first goal was scored. Bedford’s Dan Walker, with his back to goal on the edge of the box, hooked a shot on the turn that beat the outstretched arm of Kempston keeper Martin Conway, hitting the underside of the bar and bounced just over the line. A few minutes later Bedford had a penalty claim rightly turned down after a free-kick into the area was headed by Gavin Hoyte on to the hand of a defender. Bedford’s Ashton Grant then pushed the ball through to Paul Benson, but Alfie Powell managed to wedge himself between the Eagles striker and the ball to marshal it out. The hosts then had a purple patch as Luke Heneghan’s tame shot was saved by Kyle Forster, the hosts winning two corners in quick succession. On 31 minutes the equaliser came as a pass down the right was taken by Heneghan, as a flag went up for offside, but was then put down. The visiting defence stuttered and Heneghan took advantage to shoot, deflecting the ball off a Bedford leg, to loop over the helpless Forster. Confusion reigned for a few seconds before the referee indicated a goal. The Eagles went back in front on 44 minutes. Grant’s free-kick was pushed square to Walker and the striker’s 22-yard piledriver was pushed round the post by Conway. The corner found Callum Donnelly in space in the box and he directed his effort into the net from close range. In the second half neither side could unlock the defences and several substitutions follows around the hour mark. Two of Bedford’s subs, Lee Roache and Brad Woods-Garness, combined almost immediately, when a one-two allowed Roache a go on goal, but Conway saved well. The Bedford defence then recovered quickly when Josh Crawley moved through the middle to receive a pass, Ollie Swain putting him off enough. In the fourth minute of added time Bedford made the game safe. Jordan Jarrold’s free-kick down the left saw Roache beat his marker to home in on goal. Conway saved the first shot, but Roache won the next as he planted the rebound past the exposed Rovers keeper to make it 3-1. The Eagles win moved them up one place in the league to sixth, while Rovers dropped down to 13th. Bedford travel to National League North side AFC Telford this Saturday in the FA Cup second qualifying round. Rovers host Isthmian League South Central side Marlow in the same competition.